Hidden away from the world of men, an Ominous Night shrouds the dark towers and massive walls of this ancient castle. 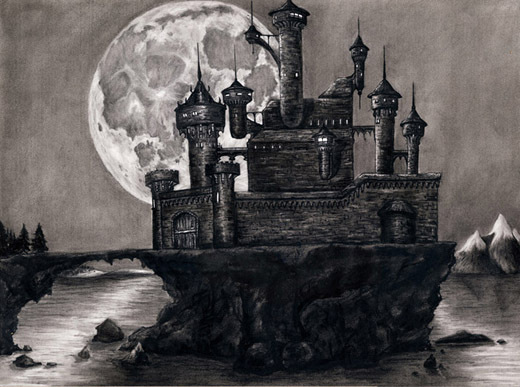 Overlooking the still depths of a silent lake, the castle and its inhabitants await those foolish enough to enter, and fear those destined to confront the castle’s evil. This piece has its origins in another piece of mine, which served as an excellent starting point, but lacked the refinement that I achieved with this work. Reminiscent of the foreboding architecture from a popular video game series, the darkness emanating from the castle has such reach, that its evil presence is even reflected in the very face of the moon. The original sold at Dragon*Con 2006. 1st Place Amateur, MidSouthCon, 2003.